Eric and I have been exchanging emails about potential analyses for the school data and he published a first draft model in Offsetting Behaviour. I have kept on doing mostly data exploration while we get a definitive full dataset, and looking at some of the pictures I thought we could present a model with fewer predictors. There seems to be a different trend for secondary vs non-secondary schools concerning the relationship between number of full time teacher equivalent and total roll. 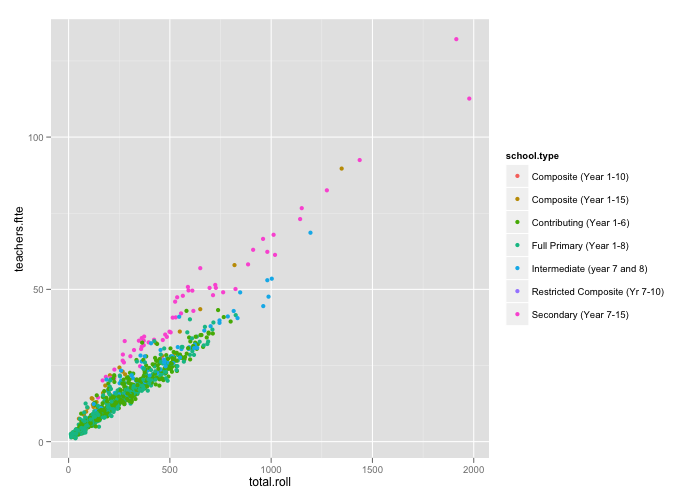 The presence of a small number of large schools suggests that log transforming the variables could be a good idea. Difference on the number of students per FTTE between secondary and non-secondary schools. for secondary and non-secondary schools. 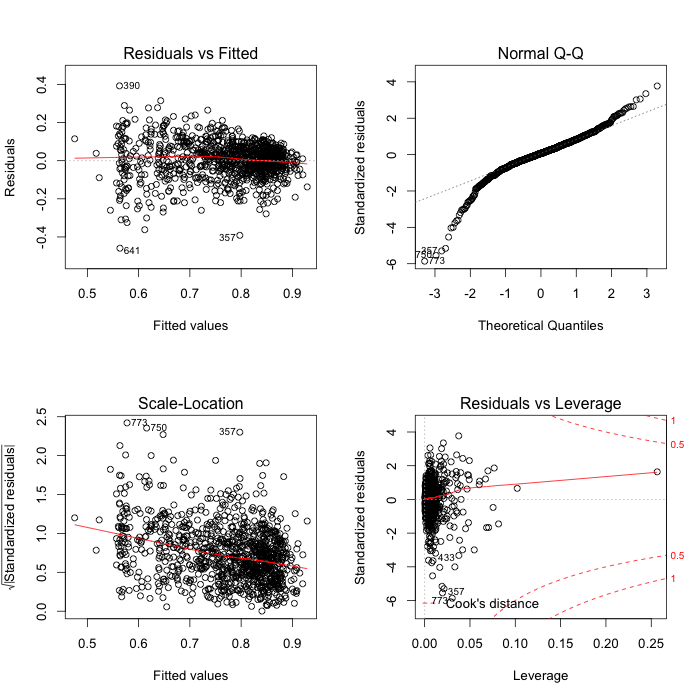 Residuals for this linear model: still a bit of a mess. If we remember my previous post decile accounted for 45% of variation and we explain 4% more through the additional predictors. Non-integrated schools have lower performance, a higher proportion of non-European students reduce performance, secondary schools have lower performance and larger classes tend to perform better (Eric suggests reverse causality, I’m agnostic at this stage), although the rate of improvement changes between secondary and non-secondary schools. In contrast with Eric, I didn’t fit separate ethnicities as those predictors are related to each other and constrained to add up to one. But differences in performance among schools of the same decile by definition have to be about something other than decile. 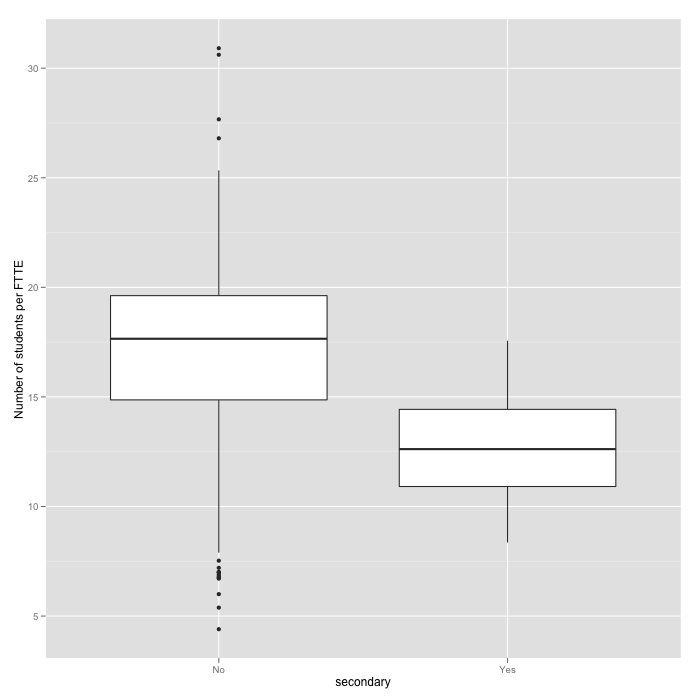 I can’t tell from this data whether it’s differences in stat-juking, differences in unobserved characteristics of entering students, differences in school pedagogy, or something else. But there’s something here that bears explaining.